Keven Barry was arrested on 20th September 1920, are we dealing with a contemporary photo or one taken after the event, the Catalogue date of 1921 would suggest the latter? Date: Catalogue date c.1921. Possibly late 1920. I'm interested by the 'T. Clarke' name over the shop - is it Tom Clarke of Rising fame or just a coincidence? It's interested to see so many well-dressed women standing around, so I suspect that's some sort of after-event. My mother is from Bray and she tells me that Kevin Barry's mother lived there and when she was a child she would see her walking around the town, and people were always doffing their hats to her and she was considered a tragic figure. I think that might have been as last as the 1960s. Had he lived Kevin Barry would undoubtedly have reached a ripe old age, although he might have not been very well known. He died very young. I think the big door at right may be Monk's bakery on Church Street/North king Street? [https://www.flickr.com/photos/sam2cents] I think it is just a coincidence. As far as I know Tom Clarke had a tobacconists shop on or close to O'Connell Street. 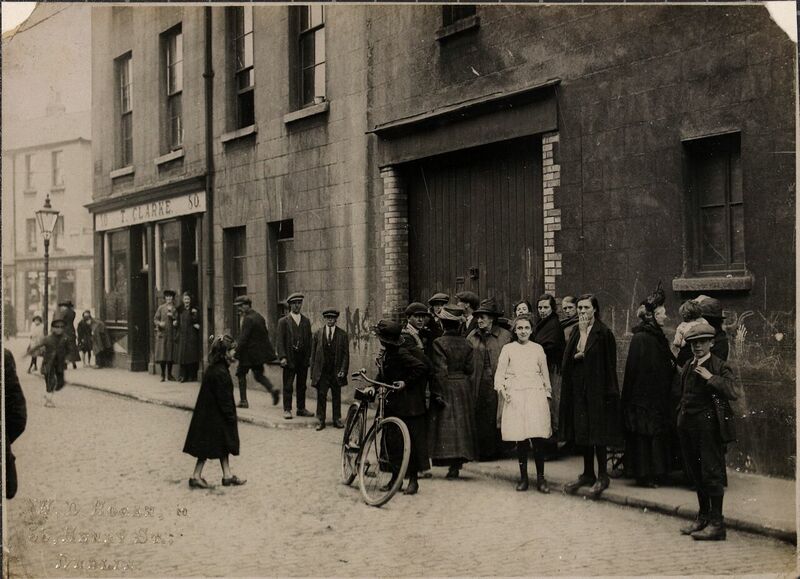 [https://www.flickr.com/photos/nlireland] Thanks for that, Nat! It is a fairly common name, but you never know. [https://www.flickr.com/photos/beachcomberaustralia] Wow! I have never heard of a photo being taken at the scene, although I know of some famous ones, like the aftermath of Sean Treacy's death in gunfight. I'm fascinated by the little boy recounting what's happened to the guy with the bike. That's one thing that we never hear much about - Kevin Barry did kill a man, but we never hear much about his victim. No 80 Church St. T. Clarke, Dairy, No.79 Church St. Patk` Monks, Bakers ( from Thom`s 1935), junction of N.King St. / Church St. where Kevin Barry was arrested, the plaque is on The Tap Bar (now closed). Thomas Clarke had a Tobacconist shop in Drumcondra (1911) later at Parnell St. I lived around the corner for many years. Never stepped foot in the Tap. Though was aware of the Kevin Barry connection. And indeed the connection with the North King Street massacre a few short years before this photo was taken. And the destruction at the Four Courts, Greek Street and Mary's Lane that would be wreaked a few short years later. Many of the people pictured witnessed more than their fair share of violence in that period. [https://www.flickr.com/photos/[email protected]] Thanks for that, Mac! [https://www.flickr.com/photos/beachcomberaustralia] I would say the reverse: I know exactly where the NLI photo is taken, 79-80 Upper Church Street, with Clarke's #80 on the corner of North King Street, Dublin, where the Tap is now. I do not know where the flickr picture of the crowd is. From the Shadows, we are likely looking East, so if it is nearby, we are probably looking East along N. King St. from the Church St. junction in that one.